Managing your hair can be complicated. In some people, it changes with the seasons, becomes too dry or oily, and produces split ends on sporadic occasions. While conditioner is good, more people have begun to try natural remedies to treat their hair. One of these is argan oil, an essential oil that’s produced from the argan, a tree commonly found throughout Morocco. Argan oil has lots of benefits to both hair and skin, with numerous beauty products being sold today that incorporate the oil into their ingredients or retail it as a single product. In this article, seven of the best argan oils are analyzed in detail, showing all the advantages (or setbacks) each product will generate for your hair. And don’t forget to check out more buyer’s information afterward, describing everything you’ll need to know before you conclude your final purchase. 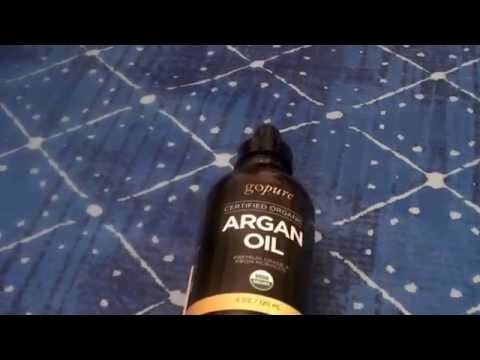 What is the Best Argan Oil for Hair in 2019? Sold in a jungle green-labeled bottle, Moroccanoil makes several bottles of argan-based oils that are sold in lots of different sizes (and shapes). This particular version is found in a .85 and 3.4-ounce glass container. A dropper is included inside, so you can better judge the amount of oil you’ll need. Apply it to split ends or simply add a little directly to your scalp to help it stay lubricated without becoming dry too quickly. If you do decide to use more, no problem. The oil won’t matt or increase your hair’s weight at all, so if you’d rather massage it all throughout the entirety of your head, it shouldn’t give you the feeling that you’re wearing a cap afterwards. And even with it being an oil, the level of grease is tolerable; it won’t make you feel as if you poured cooking spray on your head. Just don’t go too crazy with it when you’re applying. For people with a naturally oily scalp/hair, things could look unappealing if you’re using too much. Try to use in moderation. That way, the oil will not only last longer but perform much better. Additionally, shine might not be what you’re expecting. You may not even notice it unless you stand close to a mirror in a well-lit room. But Moroccanoil still scores high simply from the great work it does on split ends. It’s recommended as a starter option for anyone new to using argan oils for hair treatment. Pura D’or Oil comes in a small four-ounce glass bottle with a pump. There isn’t a dropper available but pressing down on the top is easy enough to control how much you need for your head. It’s USDA Organic also, so be assured that all contents are completely natural and free of any synthetic ingredients. Some argan oils have a reputation for being unpleasant in scent. Others are downright odious. This definitely can have an effect on how much you’ll end up using the product, if at all. But there’s nothing to fear with Pura D’or. No smell is noticeable, even after you’ve had it in your hair for a little while. And when you do work it in, the oil absorbs almost immediately upon contact, so no messy/greasy residue to speak of. Combing or brushing won’t be necessary from this either. Just get ready to deal with it sticking. This means it may take a little longer to get it absorbed than anticipated. And do take care with the pump as well. If you press down too hard, it might break. It’s made from a cheap plastic that goes in direct contrast to the glass bottle itself. People with sensitive skin have to take extra precautions when choosing an argan oil. If this applies to you, other products would probably suit you better since this tends to exacerbate breakouts. Other than these hiccups, Pura D’or holds up well for anyone that needs an argan oil that’s truly unscented. Getting oils with this attribute is sometimes hard to find, so it’s great to see a brand produce one that won’t have you reaching for additional layers of conditioner to counter any smells. 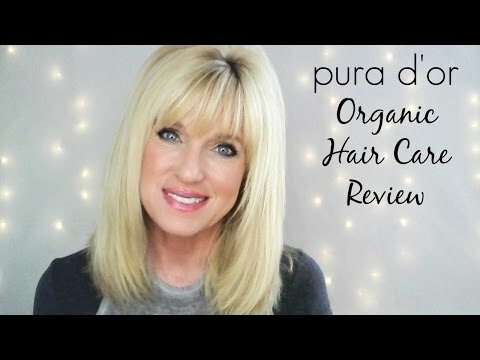 Pura D'Or Organic Hair Care Review! Aria Starr’s oil is in a one-ounce container, having no variations on size available. There is a dropper, however. It’s unlikely you’ll need to buy multiple bottles with this size with normal use. The glass is pretty dark so the oil itself will stay fresh long after you’ve purchased it. This is the argan product you want if your skin is oily. It helps keep things dry for a lot longer than a conventional conditioner, and you’ll also appreciate the way it tends to decrease the size of pores. But don’t put too much on either. The balance of having semi-dry hair/scalp will decrease when a large amount is used. For acne sufferers, breakouts will actually clear up with Area Starr. Don’t be afraid to work it into areas of your hair that have seen bad reactions to other argan oils. One issue to take note of is irritation that can happen if you’re using it too much throughout the day. Try to limit your applications to only after you’ve finished washing your hair. In this regard, most new users of argan oil may encounter slight itching, but the problem shouldn’t develop into anything severe. Anyhow, Aria Starr is well served for people who want an oil that produces a shiny but soft hair texture that will remain smooth all day long. Resembling a medicine bottle, Kate Blanc’s Argan Oil can be purchased in either a two or four-ounce container. It’s surprisingly thick, so while you probably won’t want to drop it on the floor, it should hold up well on your cabinet without getting damaged. You won’t need much for your hair regardless, so just one could be enough to last for several months or even longer. Individuals with curly or thick hair are in for a treat. If your hair has this characteristic, you’ll notice that it assists in loosening everything so that it’s easier to brush quicker. Your curls will look great and shine brightly. For frizzy hair, it helps keep everything from appearing too dry. And dry your hair won’t be due to the way it hydrates split ends and roots, no matter if your hair is long or short. Most organic products specify somewhere on the labeling whether they are or not. Kate Blanc does this also but it has some aspects that makes this questionable. Some consumers have noted that the oil shows signs of being deodorized. If this is true, such a process would take away some of the antioxidants that are naturally found in these products. This would, in theory, not make it organic. Officially, this doesn’t hinder the overall quality of the oil itself. So if you’re not picky about the circumstantial features of how it’s processed, use Kate Blanc to rejuvenate your hair to its highest potential. Virgin Argan Oil by VoilaVe continues by offering USDA Organic oil that can be used as either a hair or skin care product. The bottle is a lot larger than the others shown so far, totaling 8.5 ounces. Use this oil when you want something that’s high quality and will get you through the year without needing a replacement. Not all argan oils will give you the same results. Some help with skin more while others are good for a little bit of everything. And those made from poor standards might have the opposite effects of what they proclaim to do. Your hair will radiate and shine to a similarity of getting a new hairdo at a beauty salon. There are lots of antioxidants that allow any portion of your face that it comes into contact with to negate an aged look. Some have even used it as a hair loss prevention, working it into their head to build up fatty acids and vitamins, some of the qualities that assist in refueling hair growth. Anyone that tends to break out in pimples easily might want to skip this one. The oily feeling that it leaves will only help bumps grow. Of course, that doesn’t apply to all, so if you do have such skin, make sure that you’re not applying too much. Places with high humidity might be the worst environments for this argan oil. But if that’s irrelevant to you, definitely give VoilaVe a try. Whether your hair is wet or dry, it’ll keep it looking fresh and clean. Available in a 1-ounce container, the Eve Hansen Moroccan Oil is small enough for you to take in a purse. It gives off a clean look once rubbed in the hair, making your natural hair color bolder and smooth to the touch. This is acceptable for using when you’re styling your hair with electronics. In other words, put it on when you’re in the middle of your flat iron. It won’t burn, so you’ll not only save time from not having to go for other hair care products once you’re done with flat ironing but help the oil penetrate into your hair much better than you could with only your hands. And your pores could also shrink, especially around the edges that are close to your hairline. Only use a small amount when your styling. The oil is very greasy, so if you dislike to see it on your fingertips every time you touch your hair, take the contents from the dropper sparingly. As a result, new users with sensitivity could develop itchiness in areas close to the hairline. But this is an exception. And even then, you could always mix it up with your favorite conditioner to negate these effects, so try out Even Hansen to stir up your own beauty concoction. Teddie Organics ends the list with an argan oil that’s dark colored, bold, and fragrance-free. It’s well served for both women and men. You can use on your beard (if you’re a guy) to help uneven patches fill in quickly, or to prevent itchiness around your face when growing a five o’clock shadow. For hair, it brightens and alleviates pimples throughout, so place it directly in portions of your scalp for getting rid of breakouts that may occur with other products. Most of the negatives aren’t major. The dropper’s hole could be a tad bit smaller. It’s somewhat wide, which leaks oil when handled at certain angles. And the smell might be off-putting for some people. It’s not strong but stays on the skin and hair until you wash again. Use Teddie Organics with a leave-in conditioner or other hair/skin moisturizer to block this, or apply when your hair’s damp. Recommended for users who like argan oils that absorb quickly without making an oily mess. Finding the right argan oil for you is pretty straightforward but there are factors that will help guarantee a good purchase, one you won’t have buyer’s remorse over. When you’re looking at argan oils, you’ll notice that many of them are sold in thick dark glasses. This is not by mistake. The bottles won’t usually be fancy or carry designs either. It’s to help preserve the quality of the oil by blocking out as much light and air as possible. If you see organic argan oil being sold in a plastic container, you’ll probably need to use it quicker than the alternative. In short, dark glass bottle are the way to go, especially if you plan on using the oil long after the day it’s bought. Nowadays, there are many companies that don’t refine their products or add chemicals to them are eligible to be certified as USDA Organic. If you see the stamp on a bottle of argan oil, it usually means that no additives or processing was done in between its creation and bottling. The best will be completely unrefined and never go through a dilution process. If so, oil will appear golden in color. If the color is very dark or too light, either the batch that was purchased may contain other ingredients or was refined. As with most oils, you must experiment to see how it reacts to your body. Some products have a placebo effect on select individuals while others will almost immediately develop irritating breakouts over the area where it’s applied. Argan oil can do the same. If you’ve never tried it before, place a very small portion on a section of your hair. Rub it into your scalp thoroughly and massage any split ends. After a few hours, add more if you don’t notice any annoying sensations on your skin (around the areas you applied the oil). Furthermore, people with oily hair should always go for the product that doesn’t leave a coat of thick film around the areas being treated. There are argan oils that produce a dry but moisturized feel to hair. Of those that do, the product will usually inform you so everything will be known beforehand. To finalize, two of the best argan oils reviewed were Moroccanoil and D’or, chosen for their conditioning and ability to hydrate without leaving the hair looking too greasy. Their smells aren’t unpleasant and can be managed quickly by any hairstyle. No matter if your hair is curly, frizzy, or straight, the results will be satisfactory. Remember, you’ll know the right oil by the way it was created and the lack of changes made before being retailed. You won’t use every hair moisturizer you come across, so treat argan oil with the same stipulations given to any beauty product! Comments for "Best Argan Oil for Hair"